Horizontal stripes red-black-red with three white saltires in white in the middle. Proportions 2:3. The present flag is probably also the oldest design (16th or 17th century): a banner-of-the-arms, rotated 90 degrees. Adopted: 5 February 1975. (Source: [ped80] Pedersen 1980). Before 1975, unofficially a tricolour red-white-black with the arms on the white stripe was used. Such a flag was already know since the 17th century. Another variant used in the 17th century had seven horizontal stripes white, red, black, white, black, red, white, with the arms all over. (The arms on both variants could again be in different variants: shield only, shield and crown, shield, crown and supporters; either centered or shifted to the hoist.). Another early variant was the Dutch tricolour with the saltires in black. Amsterdam has a special Verzetsvlag ("Resistance flag"): white with the full coat of arms. Such a flag was given in 1947 by Queen Wilhelmina on occasion of the addition of the motto to the coat-of-arms 28 May 1947. This motto Heldhaftig, Vastberaden, Barmhartig ("Heroic, Determined, Merciful") was given to the city for the merit during 1940-1945. This flag is used during WWII-commemorations. Yesterday the Stadsdeelraad (cityward) "Centrum" decided that it was time that the Flagpolice should undertake some action. As I've previously reported there are a lot of rags flying about, as well as flags not being taken down after sunset, as well as a lot of minor offenses, so the Flagpolice arrived en masse in front of Grand Hôtel Krasnapolsky on Dam Square (opposite the Royal Palace), where a highworker (that modern apparatus which can nearly lift someone to the moon) sent someone to the roof, where 6 national flags were taken down. They had been flying for ages there, continuously replaced when wheatherconditions etc had taken its toll. The offense: flags are advertisement boards! And 6 advertisement board on one roof is too much. I suspect the Flagpolice is a novel gadget, and that it just learned what a flag is (an ad-board!) and that rags, like the multi-eu flag is still far beyond its comprehension. On 13 March 2004, a group of activists called "Rainbow Warriors" unfolded in Amsterdam a huge rainbow flag (100 sq. m). They wanted to protest against the prohibition of rainbow flags in the historical center of Amsterdam, decided by deputy-mayor Anne Lize van de Stoel against the advice of the municipal council. The council proposed to allow the emancipatory and non commercial flags. The "Rainbow Warriors" said that the prohibition of the flags was hypocrit, since commercial billboards are allowed because they are "short-lived" and a big source of money for the municipality. Source: Tetu.com (online magazine for gays and lesbians). Buitenveldert is a city ward of Amsterdam, the last defence against Amstelveen (and Schiphol) and very boring, though posh. The street-pattern may be familiar to USA-citizens. Some observer wrote: "The ever growing cities get into a situation, wherein the citizens consider themselves more part of a ward than of the city as a whole, and that ward is then seen as their "village". They tend to look for a simple symbol to show their identity, like a flag. Buitenveldert, a ward of Amsterdam, has its own flag, designed by one of its inhabitants, F. Muller. No mention of symbolism, but the colors are of Amsterdam, as well as the saltire; the NS arrows probably symbolize the important rôle of Buitenveldert in the connection between Amsterdam and the outlying villages. Are you sure this flag is not indeed the ensign of the Albanian snowplough squadron or ice-breaking fleet? image by Jaume Ollé, 27 Apr 2003, after Steenbergen: Vlaggen van alle Natiën, 1862. Collegie "Zeemanshoop" (College "Seaman's Hope"), established 1822 in Amsterdam. Captain J.H. de Weerd had number 576. Captain Thomas Lange's biography mentions that in 1836 the members of Zeemanshoop were renumbered; could it be that this college originally did not reuse its membership numbers. This college, was still in existence in 1979, and as far as I know, exists to this day (6 December 2001). below the centre, and it has the anchor leaning hoistward. = Captain J.H. de Weerd's flag in 1855 likewise has the anchor leaning hoistward, but has the numbers slightly off-set towards the bottom, as well as off-set towards the hoist. The latter is caused by this being the only image that shows the flag as clearly not 2:3; ignoring the flowing of the flag it has a ratio of ca. 1:2. = Leen Smit in 1935 depicted number 151 with the numbers almost centered; slightly off-set towards the bottom and the fly, and the anchor leaning flyward. I want to report the flag of "The Nieuwe Amsterdammers. See this website. We made one but it got damaged. We're planning to have one done for our next debate. The flag is: horizontal blue - black - pink; on black three white saltires. "De Nieuwe Amsterdammers" exists for 6 months, mainly active in "De Pijp" citypart (which is around the old Heineken brewery just south of the center of Amsterdam). The group consists of 10 people; its purpose is to to use the collective intelligence of "ourselves" to change Amsterdam and Dutch politics. The flag is a mix of Amsterdam, New York, stars and stripes, boys and girls, the Dutch flag - a playful interpretation of the old Amsterdam flag. 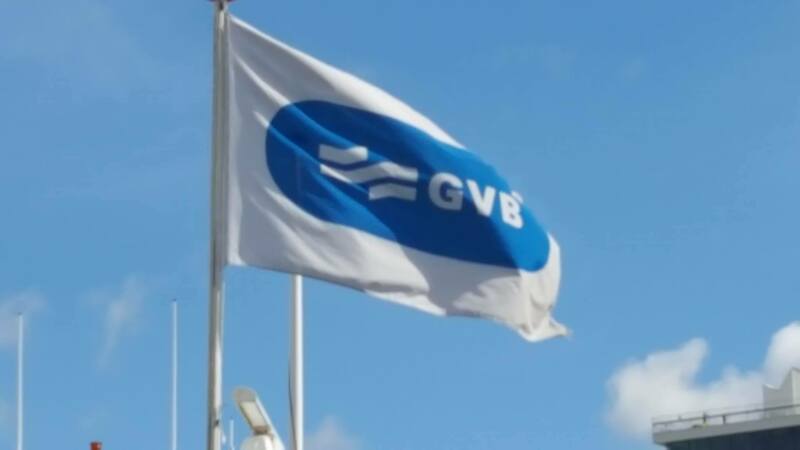 Attached are two pictures I took of the flag of the Amsterdam transport authority, Gemeentelijk Vervoerbedrijf (GVB). The flag is flown from ferries and ferry docks in Amsterdam, Amsterdam Noord and other locales. (Logo) The former flag, apparently used up until 2008 or later, is pictured here.